Think back to the moment when you just learned to improvise on guitar and played your first licks in the minor pentatonic scale. It felt awesome to be able to play over a backing track, to create your own guitar solos and to express the way you felt by means of guitar playing. You saw your improvisation qualities improve rapidly and it felt like some kind of magic. As you mastered the minor pentatonic scale completely, you may have noticed that you got stuck and your soloing didn’t improve much anymore. In this article we will talk about a few simple techniques to break through these limitations and take your blues guitar soloing to a whole new level. You have learned about the minor pentatonic scale and learned to improvise a bit, but you’ve come to a point where you don’t make progress anymore. You want your blues guitar solos to sound like the ones played by your favorite blues guitarists, but you feel like you’re stuck in the same old patterns and licks. You know your guitar playing can improve, but you have no clue how to do it. Sounds recognizable? These frustrations are shared by many guitar players around the world! Let’s look at how this happens and how to overcome these guitar playing barriers. A large share of beginner and intermediate guitar players only make use of the minor pentatonic scale to solo over a dominant blues progression. Adding up to this, they use the minor pentatonic scale over ALL chords in this blues progression, which makes their solos sound less interesting and definitely not professional. Most of these guitarists think they’re doing it the correct way, but actually they only use a very basic method of soloing. The minor pentatonic and the blues scale are the most common ways to play over a dominant blues progression, but these are definitely not the best ways of soloing if you want to sound like your favorite blues guitarists. If you want to break through your limitations and come a step closer to sounding like your favorite guitar hero, you need to explore more melodic ways of creating a blues guitar solo. If you would like some more detailed reasons why using the minor pentatonic scale over ALL chords in a blues progression is not the best method of soloing, you can download my FREE Guitar Soloing Tips guide, where I explain more in depth why using the minor pentatonic scale as the only method of playing blues solos destroys your chances of developing your guitar playing further. In this article specifically we’ll look at how to overcome these barriers by learning how chords and scales work together. As the A7 chord contains these four notes, they are also a great choice to land on when soloing. They will sound really good, because these tones can be found within the chord. If you pick these notes to land on over an A7 chord, you will be able to give a more melodic feel to your lead guitar playing and your solos will have a lot more appeal to them. Depending on which of the four notes you pick, you will produce a different emotion. Try experimenting with different notes and listen to the feeling they give you! As you may have noticed, the A minor pentatonic scale doesn’t contain the C#-note. That’s why we will use an expanded version of the scale to play over the dominant seventh chord A7: the A minor pentatonic scale with an added major third (see scale diagram below). It’s important that you realize that there are better options that we could choose than only using the minor pentatonic scale. Let me break it down for you why this is. The A7 chord contains 4 notes, which we already looked at. You see these notes again in the left colomn below. In the right colomn you see the five notes of the A minor pentatonic scale. 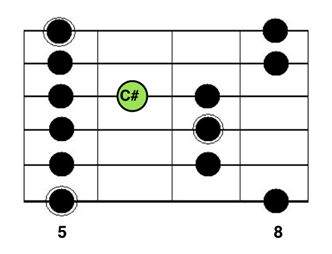 As you see in the table above, the C# note in the A7 chord clashes with the C note of the A minor pentatonic scale. Try this out for yourself on your guitar, play a C note and play a C# note an octave higher; not the best sound in the world right? Of course, a little dissonance never killed nobody and sometimes that dissonant C note might even be the perfect sound that we are after. But there will be times where you want to sound more melodically and you want to hit the perfect note at the perfect time. An approach that many great guitarists use to target the right notes over a chord progression is called “Chord Tone Soloing”. 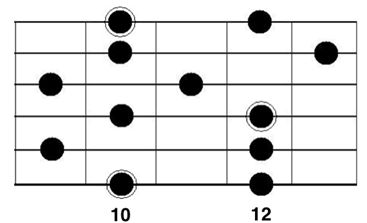 This means that you don’t play in one pentatonic scale over ALL chords, but you connect the chords being played in the progression with a certain scale. To clarify this, we start from the same standard 12 bar blues progression in the key of A as in the previous section. First off, let’s take a look at what a lot of beginner/intermediate guitarists think is the correct way of Chord Tone Soloing. Further on, I will elaborate on the correct approach and teach you how to apply it correctly. For example, if in the progression above the D7 chord is being played, a possible (but WRONG) solution would be to play some licks in the D minor pentatonic scale over this chord instead of staying in the A minor pentatonic all the way. By transposing, you would be tempted to believe that the notes in the scale you are playing (the D minor pentatonic scale) will sound much better over the D7 chord than the notes in the A minor pentatonic scale. This again is a way of thinking that is common among beginner/intermediate guitarists, but definitely not a good approach. If we analyze the D7 chord and the D minor pentatonic scale, we see that the chord contains an F#, while the scale comprises an F note. Hence, if the D minor pentatonic is being played over a D7, these notes will clash and it will sound horrible. Just transposing the minor pentatonic scale over the D chord is done by A LOT of beginner guitarists, but NO professional blues guitarist would ever dare to do this! Are you starting to see why beginner blues guitarists get stuck in their progress on the guitar? They have no clue why their guitar playing doesn’t even come close to that of the guitarists they admire; they are using the WRONG scales! Applying what we explained in the previous paragraph, we can raise the F note in the D minor pentatonic to an F# and thus play the D minor pentatonic with added major 3rd, but there are even better ways. A more advanced approach that comes closer to how great blues guitarists apply Chord Tone Soloing, is to use the D dominant pentatonic scale. In that case we raise the F note to an F# and also play the 9th, which is the E note. This scale is completely tied to the D7 chord and therefore will sound much more professional when applied over a D7. 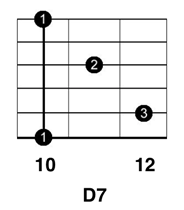 All notes that are in the D7 chord are in the D dominant pentatonic as well. You can see this for yourself below. Notice how all the notes in the chord are covered in this dominant pentatonic scale. If you’d like to know more about how great blues guitarists such as Stevie Ray Vaughan use the dominant pentatonic scale in their soloing you can download my FREE Guide on How To Play The Most Awesome Blues Licks Over Any Chord: Awesome Blues Licks.